You are invited to explore apiculture and architecture, inside our skep-inspired pneumatic structure where human beeings intertwine to share ideas, research, and other musings. A first-of-its-kind outdoor interactive space in Boston, The Lawn on D is an experimental landscape that brings together different communities, audiences and area residents for innovative programming and events in the epicenter of the Innovation District and South Boston neighborhood. The trial landscape will offer opportunities in an interactive environment to create a unique Boston experience. The Lawn on D will be open for approximately 18 months beginning in August with seasonally changing programming. With direct feedback and ideas from the community sourced during the experimental phase, the Massachusetts Convention Center Authority (MCCA) will develop plans and programs for a year-round space that will further entrench the BCEC in Boston. 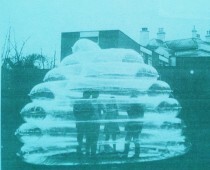 Festooning has been invited to bring our inflatable beehive to the lawn’s opening celebration. Come check it out and Kick off a first-of-its kind experience in Boston at the official opening of The Lawn on D this Saturday, August 16 starting at noon! The city’s groundbreaking new outdoor experimental event space brings art, games, food, music and free events to the buzzing Innovation District and South Boston neighborhoods. Opening festivities include live music performances , high-energy sets from Mmmmaven DJs, massmouth storytelling, interactive art projects & installations, face-painting, bocce, Ping Pong and other dynamic, community-building activities. Local food and ice cream trucks, as well as beer and wine available for purchase in the tented bar fuel up the fun. The event is free and open to the public. It sounds like so much fun, I I were in Boston instead of Nashville, I would bet there.